A friend just emailed for my bread recipe. Her daughter comes over after school, sometimes, to play with AppleApple, and they always make themselves peanut butter and jam sandwiches with big slices of my homemade bread. And the child always asks, “Is this your homemade bread, Carrie?” I gather she’s a fan. Anyway, I wrote out the recipe for her mom. And then I thought, hey, why not post it here. I do have a “Bread Baking Tutorial” over in the recipe section, but below you’ll find the messy real-life version I make almost every weekend. It’s extremely flexible, with room for all kinds of extra ingredients, and the only time it ever flopped was when I used 100% whole wheat bread flour (we were all out of white; the resulting loaves resembled building material). So don’t do that. I don’t follow a recipe, so there are no precise measurements. I make this bread so often that it’s second nature. But I’ll try to write it out for you. This makes four loaves. Stir (as often as you’d like, at any point in the above process). Add 6 cups of flour, stir. I use a mixture of whole wheat and white bread flour, probably about 1/4 ww to 3/4 white. Then start adding by 1 cup measurements. Eventually you’re going to add about 12 cups of flour total, more or less, but honestly, this is entirely by feel. When it gets too thick to stir, start kneading the flour in. 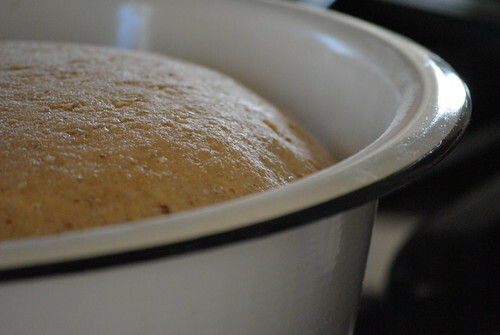 Knead until you’ve got the right consistency and it feels ready (you’ll know what I mean!). Oil and let rise for an hour or two. Punch down and cut into four sections, shape into loaves, and let rise again in greased loaf pans. Heat oven to 450, bake for ten minutes, then turn down to 350 without opening oven and bake for another thirty. Cool on rack. Done! Also note: I have a coffee grinder that I only use to grind seeds/grains. It’s very handy, very inexpensive. I think it grinds about a 1/4 cup at a time, but it might be slightly more — that’s how I measure the seeds/grains that I add in — whatever fits in the grinder. Yum. Did you know that you can use the same coffee grinder for coffee. After grinding beans, take a hunk of bread and wipe the inside of the grinder out — carefully — and you won’t transfer taste. I love when other people’s kids are fans of my cooking. It feels like a major compliment. Your bread sounds awesome. I do sourdough bread now because it’s so drop-dead easy and flexible, but my husband tells me he still likes my yeast bread better. Oh well – he can fiddle with it if he wants. sourdough!! I just discovered sourdough! we love it. so rich tasting. so hearty. how did it take me this long? We have two grinders. But that’s a good tip, Susan. I could stand to clean my seed grinder! Yes — it makes me happy to hear that a kid who is not related to me likes my cooking/baking! I’ve never tried real sourdough, though I did bake a countertop version in a cast iron pot fairly regularly a few years back; it looked beautiful, but the kids found it too chewy, too crusty.